I was discussing the new Trinity Intranet with a colleague yesterday, in particular the subject of contributing to (and commenting on) the various KB’s, Blogs, wikis and forums. My colleague (who will remain nameless) expressed concerns that their opinion may not be valid or considered authoritative, in short they were suffering from a fear of their voice not being listened to, or worse, being attacked in some way. This struck me as both interesting and ironic. The person in question uses various social applications on the public internet (e.g. Facebook, et al) and regularly posts updates and commentary that has the potential to be seen by anyone on planet earth with an internet connection (and the inclination to look for it). Therefore why have any reluctance to post to the Intranet? The audience is subtlety and significantly different. On the public internet the audience is almost entirely made up of people you do not know and do not and direct personal interaction with. Given a world population of 6.77 billion [source: http://en.wikipedia.org/wiki/World_population] the percentage of people you “know” is infinitesimally small, even when you subtract the number of humans without internet access, those too young, too old (and, of course, the 4 blind Tibetan monks walking along the road to enlightenment – but that’s a post for another day! ), the percentage doesn’t change – it is too small to worry about. Therefore is the fear born out of peer acceptance? That fact that within a relatively small organisation, such as ours, you “know” a much higher proportion? Is the fact that you care about their opinion of you? While I believe that peer acceptance is vital, it speaks to personal brand and reputation, the acceptance will be better served by stating your opinions/thoughts/ideas and engaging your peers in conversation and debate. 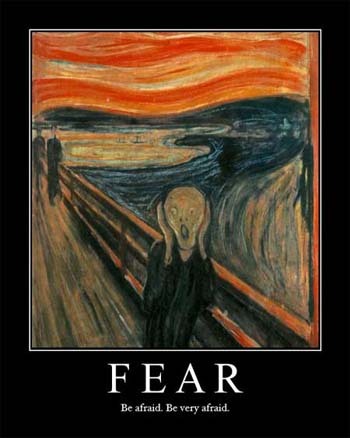 This leaves the question, how to overcome the fear?